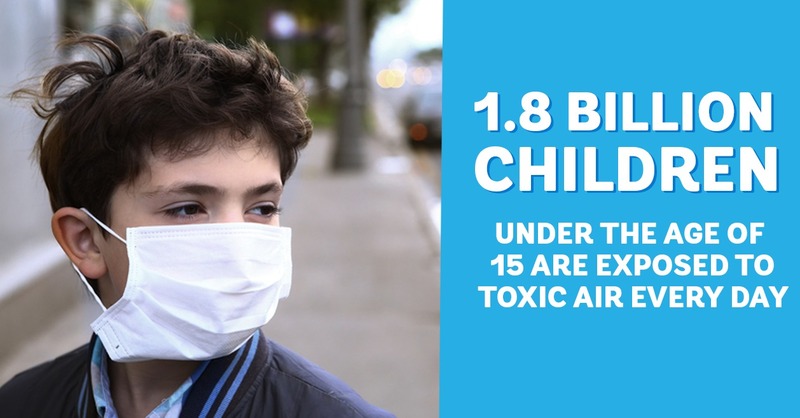 It’s a shocking statistic: According to the World Health Organization (WHO), more than 1.8 billion children under the age of 15—93 percent of the world’s population of children—are exposed to toxic air every day. That’s the finding of WHO’s new report, called Air Pollution and Child Health: Prescribing Clean Air, which outlines the grave situation facing the world’s children. While there are the immediate risks to breathing, there are also long-term effects: air pollution stunts neurodevelopment and cognitive ability. It can also cause asthma, and even childhood cancer. What’s more, children who have been exposed to high levels of air pollution could be at greater risk for chronic diseases such as cardiovascular disease later in life. And according to the report, children are at greater risk simply because they breathe more rapidly than adults, taking in more pollutants over the same span of time. The report also identifies household pollution as a factor—oftentimes, reports concentrate only on outdoor pollution. But given that indoor air is often two to five times more polluted than outdoor air, the concerns are amplified. The report was released in the run-up to WHO’s First Global Conference on Air Pollution and Health, which opened in Geneva, Switzerland in the fall and provided an opportunity for world leaders to discuss the effects on air pollution and develop action plans. These included a call for governments to adhere to WHO’s global air quality guidelines, the reduction in the use of fossil fuels, a renewed reliance on clean energy technologies and a focus on improving indoor air quality. One such way to accomplish the latter lies in actually cleaning indoor air. The complete line of AeraMax Professional air purifiers removes harmful particulate, chemicals, pathogens, bacteria, volatile organic compounds and other pollutants from indoor air, using an advanced True HEPA filtration system that effectively and efficiently traps tiny particles. Given that the AeraMax Professional air purifier continually scans the environment—working when it senses pollutants in the air—occupants can rest assured that AeraMax Professional effortlessly works to improve indoor quality in places like daycare centers, educational institutions and buildings. AeraMax Professional Wins Big Which Commercial Air Purifier is Right for You? Harvard Research into Indoor Air Quality and Workplace Productivity How do air purifiers work?